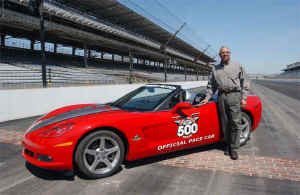 General Colin L. Powell, former U.S. Secretary of State, will drive a 2005 Chevrolet Corvette convertible pace car to lead the field to the start of the 89th running of the Indianapolis 500 on May 29, 2005. Neither Powell nor the Indianapolis Motor Speedway is a stranger to Corvette. For a record seventh time, Corvette will pace the Indianapolis 500, and Powell owns a 2005 Corvette coupe. This race will be the track debut of the sixth-generation Corvette convertible. It marks the fourth consecutive year and 16th time overall that a Chevrolet has served as the official pace vehicle-the most appearances by any brand. 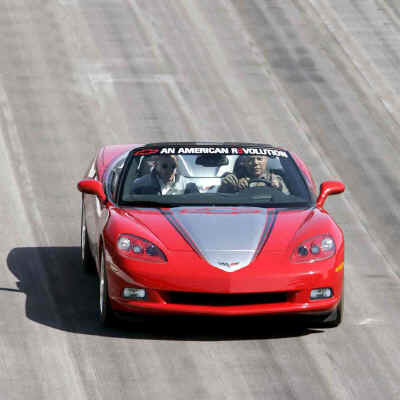 The 2005 Corvette convertible pace car features a "Victory Red" paint treatment with a bright "Machine Silver Metallic" primary stripe down the center flanked by titanium and black accent stripes. The 2005 Indy 500 logo is on each door and is embroidered on the headrests while the Chevy red racing Bowtie appears at the top of the hood. The windshield also displays Chevy's "An American Revolution" slogan, and the overall theme emphasizes Chevrolet's pride and passion for innovation, its success in motorsports and the energy surrounding the launch of 10 new car and truck products in 20 months.